Pakistan’s relations with its neighbor remain tense, and over the last five years Pakistani attitudes towards India have become more negative. Currently, only 14% of Pakistanis see India in a positive light, while 75% give the country an unfavorable rating. A majority of Pakistanis consider India a more serious threat to their country than al Qaeda or the Taliban. Likewise, Indian attitudes toward Pakistan are generally negative – 65% express an unfavorable opinion of Pakistan and a plurality considers Pakistan the greatest threat to their country. 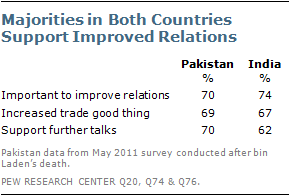 Despite the tensions, Pakistanis and Indians agree that it is important to improve relations between the two nations. Publics in both countries are supportive of additional diplomatic talks and stronger trade ties across the border. Pakistanis have become increasingly critical of their traditional rival over the last five years. In 2006, one-third expressed a positive view of India, compared with just 14% in the current poll. Today, Pakistani attitudes toward India are nearly as negative as they were in the spring 2002 Pew Global Attitudes survey, conducted a few months after a standoff between the two countries following a December 2001 terrorist attack on the Indian parliament. Pakistani views of India are considerably more negative than those in other Asian countries surveyed, although more than half (53%) of Chinese also have an unfavorable opinion of India. By comparison, India is much better regarded in Indonesia and Japan, where roughly six-in-ten (61% and 59%, respectively) have a favorable view of the country. Decades of military tensions between India and Pakistan continue to raise security concerns in the sub-continent, and today nearly three-in-four (74%) Pakistanis consider India a serious threat to their country, including 54% who say it is a very serious threat. Roughly half consider the Taliban (54%) and al Qaeda (49%) serious threats. When asked to name the greatest threat to Pakistan – among India, the Taliban and al Qaeda – a majority of Pakistanis (57%) rate India as the greatest threat, while just 19% say the Taliban and only 5% think al Qaeda is the biggest threat. Pakistanis are increasingly more likely to see India as the top threat; 48% said this was the case in 2009 and 53% named India in 2010. Fears about the Taliban have also declined; 19% name the Taliban as their country’s biggest threat, compared with 23% a year ago and 32% in 2009. The killing of Osama bin Laden has not significantly affected Pakistani views about the threat from al Qaeda or the Taliban. In the April 2011 survey conducted before the terrorist leader’s death, 16% identified the Taliban as the greatest threat, while 4% said al Qaeda. Pakistanis residing in the Punjab province are more likely to consider India the greatest threat than are residents of other provinces. Two-thirds in Punjab say that India poses the top threat, compared with 49% in Sindh and 44% among those residing in Khyber Pakhtunkhwa. PML-N supporters (69%) are also more likely than PPP supporters (51%) to name India as the leading threat. Indian views of Pakistan are also overwhelmingly negative. Only 14% give Pakistan a favorable rating, while nearly two-thirds (65%) have a negative opinion. By contrast, Pakistan is much better regarded in Indonesia, where roughly six-in-ten (62%) give the country a positive rating. However, in the other predominantly Muslim nations surveyed – Lebanon, Egypt, Jordan, the Palestinian territories and Turkey – opinions about Pakistan are on balance negative. About half (51%) of Chinese and a 44%-plurality of Japanese respondents also have unfavorable views of Pakistan, as do 91% of Israelis. Roughly three-in-four Indians (76%) consider Pakistan a serious threat to their country. More than six-in-ten also rate the Islamic extremist group Lashkar-e-Taiba (64%) and the communist extremist groups commonly known as Naxalites (62%) as serious threats. Half feel this way about China. 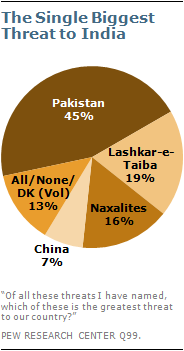 When asked to name the greatest threat to India – among Pakistan, Lashkar-e-Taiba, Naxalites and China – a plurality of Indians (45%) considers Pakistan the top threat. Nearly two-in-ten say this about Lashkar-e-Taiba (19%), while 16% rate Naxalites as the greatest threat and only 7% place China in this position. Even though tensions between Pakistan and India loom large, publics in both countries are supportive of greater diplomatic and economic ties across the border. Large majorities of Pakistanis (70%) and Indians (74%) say it is important that relations between the two countries improve. Both publics also want more bilateral trade – nearly seven-in-ten (69%) Pakistanis see increasing trade with India as a good thing, while 67% of Indians also support this idea. In addition to trade ties, majorities in both countries are supportive of further diplomatic talks between the two nations. At the crux of tensions between India and Pakistan lies the Kashmir dispute. 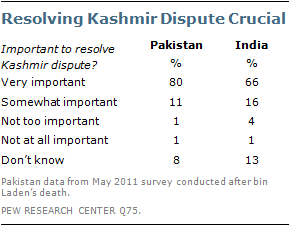 Nearly three-fourths (73%) of Pakistanis consider the Kashmir dispute a very big problem. Majorities in both countries think it is important to find a resolution to the Kashmir issue, but Pakistanis are more likely than Indians to give this issue high salience (80% vs. 66% very important). Majorities of Pakistanis across age, education and ethnic groups agree that resolving this issue is very important. Pakistanis are considerably less likely than Indians to see American policies in the region as fair toward both countries. Only 9% of Pakistanis see the U.S. approach in the sub-continent as fair, while more than half (52%) say U.S. policies favor India. Only 6% believe that U.S. policies favor Pakistan. Solid majorities of Punjab residents (63%) and PML-N supporters (69%) believe that American policies are biased in favor of India. Indians are more divided on this issue. Nearly three-in-ten (27%) say that U.S. policies in the region are balanced, while a similar proportion (29%) believes that the U.S. favors India. Only 13% say that Pakistan garners greater favor. Many in both countries think the India-U.S. relationship has grown stronger in recent years. A plurality of Indians (46%) says relations between their country and the U.S. have improved. An equal number (46%) of Pakistanis agree that India-U.S. relations have improved, up from 37% last year.